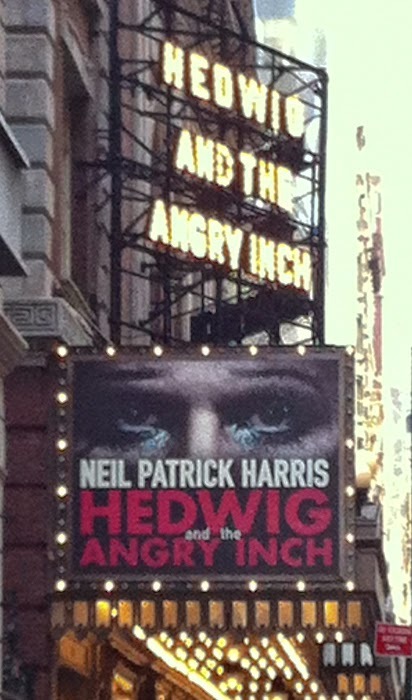 Last weekend I went to New York to see Hedwig and the Angry Inch. I've long been a fan of the movie so when I found out that Neil Patrick Harris was going to be reprising the role on Broadway I had to make the trip and go see it. It did not disappoint - he was amazing and the show was fabulous. So exciting! And I got to see one of my BFFs from Halifax who also came down for the show. It was really great to see her for a weekend. 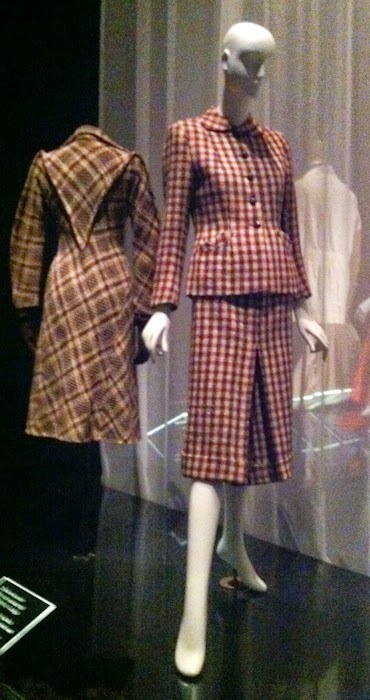 We also went to an exhibit at the Fashion Institute of Technology of 1930s fashion. I took these pictures sneakily. Here's an outfit from April 23. Forgot to take off my dog tag. 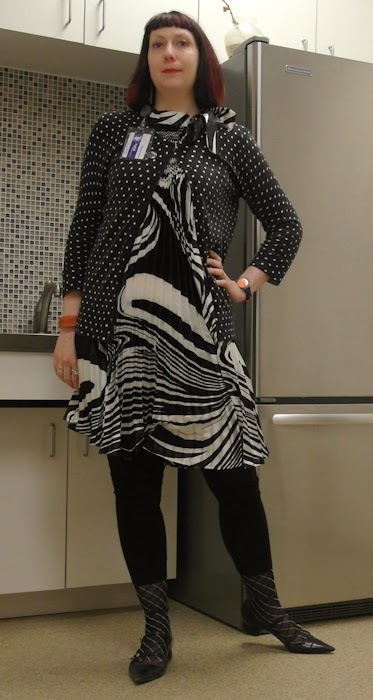 I bought this dress in Halifax and I don't think I've ever worn it but I noticed in the window of Joe Fresh that black and white patterns seem to be big this spring so I dug it out of the back of my closet. I think I'll be wearing it a lot this spring. A coworker found me in the middle of taking photos. I really like this shot of me. It's very candid. I can't believe you haven't worn that dress before, it's fabulous. And I agree, the photo of you smiling is great; why is it so hard to smile naturally in posed photos? I can't manage it at all, although in non-photo life, I smile all the time! 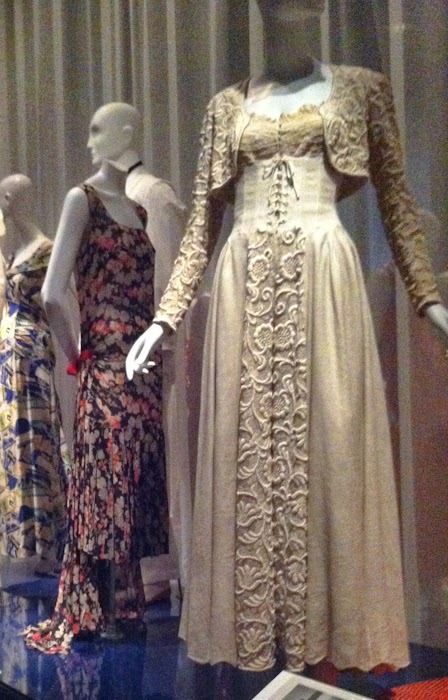 That is a beautiful dress, floating but dramatic and it suits you so much. 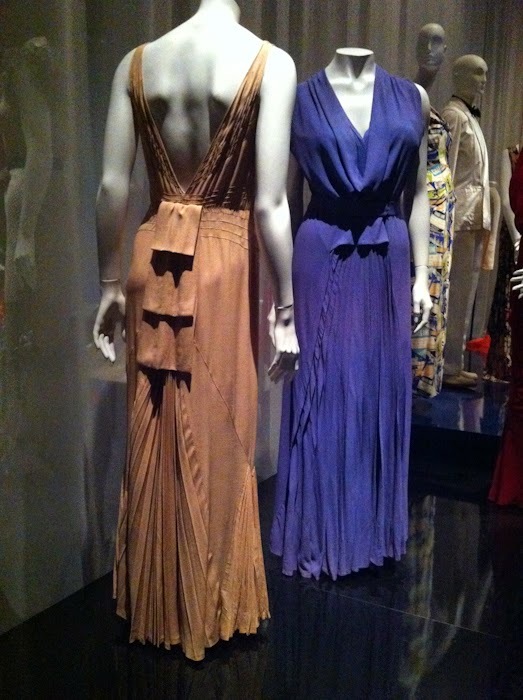 That is a beautiful dress - love the pleating and the shape! I can rarely get a natural smile when taking photos for my blog, I always look kind of "pinched". So lucky you got to do a quick New York trip - I'm sorry to have to miss the exhibit at FIT. Good for you for being a sneaky blogger and getting some photos. I haven't even seen the film of Hedwig and the Angry Inch. I must look for the DVD. Your dress is AH-MAZE-ING! Your photo fit right in with those fabulous outfits from the FIT. Yes, that's a great photo of you! Maybe you can plan to have your colleagues interrupt your photo shoots more often. Oh, I love Hedwig! I would love to see it live. Great dress! That candid photo is wonderful!